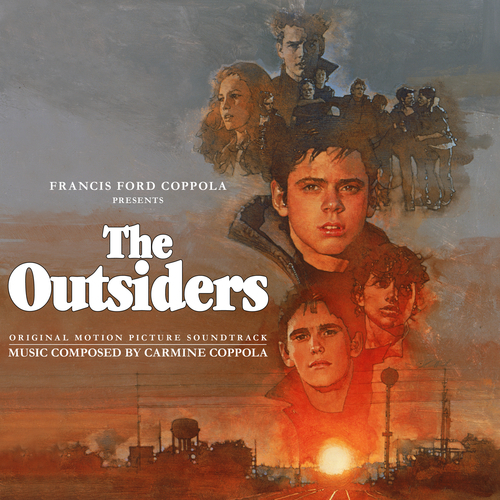 THE OUTSIDERS OST-30th Anniversary Edition. Carmine Coppola’s lush epic Hollywood vintage style score to Francis Ford Coppola's 1983 teen gang movie, based on S.E. Hinton's novel, The Outsiders featuring a group of young actors destined for stardom - Matt Dillon, Rob Lowe, Patrick Swayze, Emilio Estevez and Tom Cruise. The score to the film was written by Francis Coppola's father Carmine who contributed music for all three Godfather films, and shared an Academy Award for Part II with Nino Rota. This 30th anniversary remastered edition is the most complete version of the soundtrack and contains much unreleased music from the film, most notably Stevie Wonder's tender and beguiling ballad Stay Gold. The poster inlay contains an extensive essay on the music to the film based on interviews with those involved including Francis Ford Coppola.